WASHINGTON, D.C. -- Every investigative journalist eventually faces the question: How far are you willing to go? For Woodward and Bernstein, the answer meant following a petty hotel burglary all the way to the White House; for Geraldo Rivera, it meant bringing a living, breathing medical examiner to the prime-time excavation of Al Capone's empty vault. For me, it means deciding if I should rub my face against Lleyton Hewitt's sweat-soaked match towel. Actually, it could be Andy Roddick's towel. Or maybe John Isner's. Perhaps it belongs to Juan Martin del Potro, who in a few days will capture this tournament on the hottest, steamiest day of the year behind a flurry of one-shot, one-kill winners, later explaining his heat-beating, go-for-broke tactics with a succinct, "If you run, you die." Point is, the towel is legit. The real, extra-absorbent deal. And really, really gross. I'm standing in the walk-in, closet-sized laundry room at the William H.G. FitzGerald Tennis Center, home to the Legg Mason Tennis Classic, almost certainly the wettest event of tennis' perspiration-drenched summer season. (No. 1A? Cincinnati.) All around me are soggy towels -- crumpled on the floor, draped across wooden benches in the adjacent locker room, piled high in white plastic hampers. And, of course, the Hewitt/Roddick towel, plucked from a hamper, held between my thumb and forefinger, limp and disturbingly weighty. "You sure you want to see this?" asks Alex, the tournament laundry guy. I do. Er, did. After all, this is a story about sweat. Icky, sticky sweat. The utterly unfathomable, borderline obscene amount of sweating done by pro tennis players, a veritable exudation monsoon, even by the waterlogged standards of pro sports. You think you have a clue? Trust me: You don't. "Sweat cost me cash and victories," says former pro Justin Gimelstob. "There's no athlete on the planet who sweats more than I did. I don't say that to brag. That's a concession. Sweating is incredibly healthy for a normal human, but for an elite athlete it's a liability." Gimelstob isn't joking. Never mind the abnormally cool temperatures in New York this year -- on tour and in the Grand Slams, sweat can be the difference between winning and losing. Between winning and losing one's lunch in the courtside flower pots. Between smacking an ace and sending your racket into the opposing service box, as a perspiration-palmed Novak Djokovic embarrassingly did during his third-round Open victory over Jesse Witten. "I get the sweat a lot," Djokovic told reporters afterward. "And then I just didn't squeeze the racket. You know, when you want to make it faster, obviously you have to pop it with the wrist really fast, and then I just dropped the racket. It was embarrassing." I wanted embarrassing. I wanted first-hand -- first- face -- experience. Only sitting in a sauna seemed inauthentic. So I came to the Legg Mason, where Alex works from 8 a.m. to midnight, cleaning, drying and folding about 400 towels a day. Just from practices. (Matches produce 30-40 more towels per session). Hanging from a wall are smashed rackets: one from Marat Safin, two from Roddick, a stick from Gael Monfils that appears to have perished in a fistfight with a Grizzly bear. Against the opposite wall sit a large commercial washer and two dryers, all three running nonstop. By week's end, Alex will go through five 1.4 gallon bleach bottles and two 28-pound tubs of powdered detergent, plus numerous cans of air freshener (too numerous to count, he says). Alex drags a hip-high blue plastic bag across the room. He asks me to pick it up. I try one hand. I need two. "They're heavy," he says of the towels inside. "It's amazing how wet they get just from the sweat." Amazing. That's one way to describe it. Patrick Ewingesque would be another. I decide that holding a sack of used match towels is enough -- from a journalism standpoint, there's nothing to be gained by burying my nose in one, no matter what Geraldo would do. Just then, Hewitt drops off some laundry. He's wrapped in a towel. I feel even better about my choice. Alex points to a metal shelf loaded with smaller plastic bags, each about a foot and a half high. The bags contain players' dirty, sweaty clothes. They get heavy, too. I ask Alex if he does his own laundry. "I have a fiancée; she does the laundry at home," he says with a laugh. "I get enough of it here." Sweat happens. It's the unified field theory of tennis, linking the dark spots on Jo-Wilfred Tsonga's crimson microfiber shirt to Robert Kendrick's glistening white wristbands; sleeveless tees and shirtless, leather-skinned coaches to the Mary Poppins umbrellas held, Fonzworth Bentley-style, over players during changeovers; fans in the stadium court box seats to the paper fans in their hands, flapping like butterflies during a shade-free late afternoon match. Sweat is why retired great Ivan Lendl and former Thai star Paradorn Srichaphan curiously kept sawdust in their pockets (to minister slippery grips). Why big-serving big man Ivo Karlovic drinks a bigger-gulping 10 liters of water a day (the equivalent of 2 1/2 gallons, just to replace the fluid he's losing). Why Mardy Fish wakes up to use the bathroom "five or six" times a night (unfortunately, fluid replacement isn't a 1:1 deal). Why Gimelstob regularly packed as many as 10 shirts in his bag for three-set matches (because 11 would have been overkill). "I would have to pack like I was going away for the summer when I would go to the U.S. Open," Gimelstob recalls. "In a five-set match, I'd go through 15 shirts, 12 wristbands, three shoes, three socks. I'd have a pile that looked like a fraternity house next to my chair. TV used to get a kick of it. "I literally could have changed my shirt during every single changeover. One time I changed right after the warm-up. True story. The chair umpire looked at me like I was crazy." Just how much sticky, sweaty runoff do tennis players produce? There are two ways to measure it. Method No. 1: Find a scale and do the math. According to Dr. Michael Bergeron, a University of South Dakota professor and director of the National Institute for Athletic Health and Performance, a heavy-sweating junior player can lose up to three liters of fluid in a hour, while a heavy-sweating pro can excrete an entire gallon. Tour pro and former NCAA champ Somdev Devvarman says he's lost six pounds during a three-set match. Retired four-time Grand Slam winner Jim Courier recalls sweating out eight pounds. The 6-foot-9 Isner, who trains in steamy Tampa, once dropped nine pounds ... during a two-hour practice. Sweat assessment method No. 2: Talk to the ball kids. Like Catlin, who works at the Legg Mason. Catlin can't tell you how much a major league sweater like Roddick weighs after a match. But she can tell you what kind of undergarments the pros wear. At least the pros who favor white shorts. "Mario Ancic used to have polka dots," Catlin says, laughing. "We had a Polish player yesterday wearing neon stripes. It's like, wear black, gray, anything but white. The players get so wet, it's pretty gross. Sometimes they leave a spot on the ground." "Radek Stepanek used to pour out his shoes. His socks would be yellow." As in, he had yellow socks? "No, they were white. That's what made it disgusting." In the world of tennis sweat, ball boys and girls are the first responders -- which is to say, they have to catch and hold towels. Towels soaked with perspiration, saliva (some players bite) and snot (other players blow their noses). Towels the pros depend on, like security blankets, often in obsessive-compulsive fashion. Greg Rusedski asked for a towel after every point. Andre Agassi wanted towels on both sides of the baseline. Courier needed one in each corner. Arnaud Clement refused to take towels unless they were held wide open, the way stage flunkies offered James Brown his signature cape. During the third set of a steamy, late-afternoon Legg Mason match, Michael Russell calls for a towel. He wipes his face. His neck. The back of his head. His face. The back of his head. His face again. He performs the same routine between each point. Meanwhile, opponent Yen-Hsun Lu wipes his forehead with his (relatively) dry sleeves, having already soaked through the rest of his shirt and his now-translucent white shorts. (No polka dots, in case you're wondering). "Sometimes you hand off towel duty to the new kids," admits a veteran Legg Mason ball boy. "The hardest thing for me is when I sweat so much on the court that I want to wipe my own face. But we're here to serve the players." 1. Those for whom perspiration is an annoying nuisance -- like toss-altering breezes, or whistling Frenchmen -- requiring simple, mostly effective work-arounds, such as water-resistant grip tape. 2. Those who never seem to sweat, ever, because they are actually genetically engineered tennis super-soldiers sent from the future to mock humanity's susceptibility to heat and humidity. Think Bjorn Borg and Gustavo Kuerten. Mats Wilander and Wayne Ferreira. The perpetually arid Roger Federer. "You see Federer in the middle of fifth set at Wimbledon and he looks like he's sitting in an air-conditioned room watching television," Gimelstob says. "Borg goes five years without a drop of sweat on his shirt. Those guys have a huge advantage. They're not losing nearly as much." 3. Those for whom sweat is an existential nemesis, a foe that can never be defeated, merely fought to a draw. Or not. "For sure, sweating cost me matches," says former pro Alex O'Brien. "I played in Philadelphia once, 100 degrees, 92 percent humidity. You walk onto the court and you think you're going to die. It was against Brett Steven. He gave me a pasting, 6-0, 6-1. I couldn't even hold onto my racket. "Sweat can be a nightmare sometimes. It's pretty insane trying to replace the fluids. Sometimes my shoes got so wet, they'd create a puddle. Water would slosh out when I would step. I'd pour the sweat out during changeovers and just start laughing. It was ridiculous." O'Brien's perspiration problems became so unmanageable he sought help from an expert. So did Patrick Rafter, whose Hall of Fame career was marred by cramping (most notably during a 2001 Australian Open semifinal loss to Agassi). In fact, both players saw the same guy: Bergeron, who also worked with Gimelstob -- the same Gimelstob who cramped his way to a 2003 Australian Open loss to Younes El Aynaoui, then had to hear John McEnroe publicly lambaste his fitness during a television broadcast. "I was an incredibly hard worker!" Gimelstob protests. "But I used to cramp unbelievably badly. I couldn't figure out why." Bergeron put Gimelstob on a laboratory treadmill. Room temperature? A climate-controlled 98 degrees. Gimelstob ran for an hour. No breaks. No water. The treadmill ended up slick. His shoes ended up squishy. Afterward, Gimelstob stepped on a scale. He was nine pounds lighter. "It was a huge mess," Bergeron recalls. "Justin had the highest sweat rate I've ever measured." Sweating can be good. It helps the body cool itself. But sweating can also be bad, because it leads to dehydration. Not kinda-thirsty, have-a-headache dehydration. Pain dehydration. A player with a high sweat rate can secrete more than three liters per hour, approximately 6.6 pounds of liquid. As a general rule of thumb, any fluid loss greater than 2 percent of total body weight results in decreased performance: reduced hand-eye coordination, impaired decision-making, and up to a 20 percent drop in strength and aerobic capacity. Worse still is the cramping, which starts as innocuous twitching and ends as pure agony. O'Brien recalls playing against Aaron Krickstein in Miami, up 5-3 in the third set, hitting a return at 30-all. His quad cramped up. Then his back. O'Brien fell to the ground. Tournament staff tried to pick him up. Full body cramps ensued. He left the court on a stretcher. "I drank a ton before matches," O'Brien says. "But sometimes it didn't matter how much I drank. You lose it more quickly than you can replace it." Rafter drank lots of fluids, too. He still suffered cramps, because cramping isn't simply a function of sweat. It comes from sweat-induced mineral loss. And just as differences in sweat rate are largely genetic -- and also related to fitness level and muscle mass -- so too does salt secretion vary among pros. To wit: A player who loses 1,500 milligrams during a three-set match can likely make up the resulting salt deficit with a normal diet. No worries. But a player such as Rafter, who loses 9,000-plus milligrams over the same time period, needs to be more strategic. Eating and drinking becomes a round-the-clock equation: How much am I losing, and how much do I need to ingest? Bergeron put Rafter on a plan that had him literally counting water bottles while watching the clock during U.S. Open changeovers. He told Gimelstob to drink specific amounts of salty fluids at specific times, even during warm-ups. (When Gimelstob subsequently defeated Jonas Bjorkman in Thailand despite brutally sultry conditions, he sent Bergeron a note of thanks). 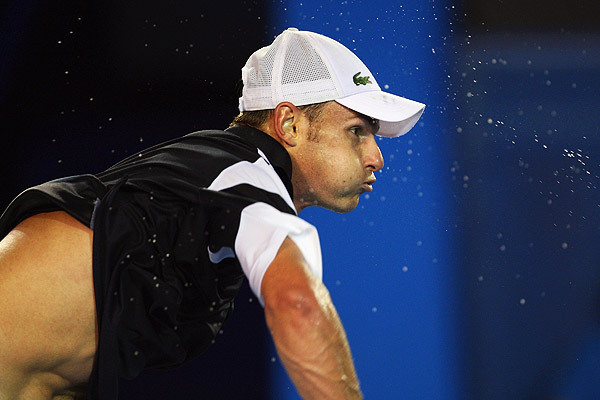 Today, it's not uncommon to see players such as Roddick sprinkle salts into their water bottles. Some players gulp pickle juice, and Isner swears by coconut-spiked water that's high in potassium. Like Fish and Karlovic and everyone else on tour, Isner is constantly, incessantly pounding fluids -- the night before a match, two days before a match, even on the airplane heading to a tournament. "My goal," he says with a laugh, "is to use the bathroom on the plane. A few times." "There's Not Anything You Can Do"
Blood everywhere. Only Courier couldn't have been happier. The former world No. 1 had just won a tournament in Orlando, enduring stifling, sapping heat. Now he was cramping, drenched in his own runoff, barely able to stand. He accepted his trophy, stopped for a post-match interview, staggered to the locker room. A tournament doctor attempted to give him intravenous fluids. The doctor picked -- and pricked -- the wrong spot. "I was not only dehydrated, cramping and in extreme pain, but also now covered in my own blood," Courier recalls. "Then the IV hits, and it's a relief. An absolute relief. One of the sweetest feelings." Other methods of dealing with tennis sweat are decidedly less extreme. To build a better wristband, the long-armed Isner goes MacGyver: He takes a normal-sized band, flips it inside out and cuts it along the seam, creating a larger, Allen Iverson-like forearm sleeve. For his part, Gimelstob wore the biggest, thickest wristbands he could find. He never put sunscreen above his cheeks -- otherwise, the ointment would run down and sting his eyes. He also mastered changing his shorts without taking a bathroom break, placing a towel over his lap and having ball kids stand in front of him. Boom! "I would check the towels before the tournament and see if they were up to snuff," Gimelstob recalls. "If they weren't, I would bring my own from the hotel. "Try serving out a match where you have to serve 130 mph down the line, only you're not sure if your racket is going to slip. It's a nightmare. Sometimes, it's B.Y.O.T." As a sweat-mastering measure, Karlovic jokes that he tries to spend daily time in the sauna. In reality, he concedes, he can wring his shirt like a washcloth following a summertime match. More often than not, coping means enduring. "If it's really hot, there's not anything you can do," he says. "It's just difficult for everyone." Is it ever. While working as a television analyst in 2007, Gimelstob tried to interview Svetlana Kuznetsova during a steamy May day in Paris. The rivulets of sweat running down Gimelstob's face -- first salty trickles, then shimmering streams -- reduced Kuznetsova to uncontrollable laughter and forced a reshoot. A reshoot that took place after Gimelstob toweled off and changed his top, of course. "Hey, I'm easy to find in the booth," he says of his television work. "I'm the only commentator who has to bring three shirts."